Jason Ganter has worn many hats in his life thus far: defensive back for Penn State football, right-hand man to Joe Jonas, and now, member of the production team for NBC’s coverage of the 2014 Winter Olympic Games in Sochi, Russia. He’s added to his colorful career by serving as Director of Communications for the Lunar Lion, Penn State’s moon mission and the university’s entry in the $20 million Google Lunar X Prize (GLXP) competition. In this role, he supervises the project’s public relations and its “Man on the Street” Youtube series, and ensures that the moon mission is meeting its GLXP competition requirements as it progresses. Ganter, one of four sons of former Penn State offensive coordinator Fran Ganter, grew up in State College and enrolled at Penn State in the fall of 2003 as a Broadcast Journalism major, hoping to become a sports anchor like his uncle, Jimmy Cefalo. However, looking to pursue a field that he was less familiar with, Ganter switched into the Economics major — then housed in the Smeal College of Business — at the beginning of his sophomore year, with an eye on someday pursuing the sports business field. Ganter also played four seasons of football at Penn State. 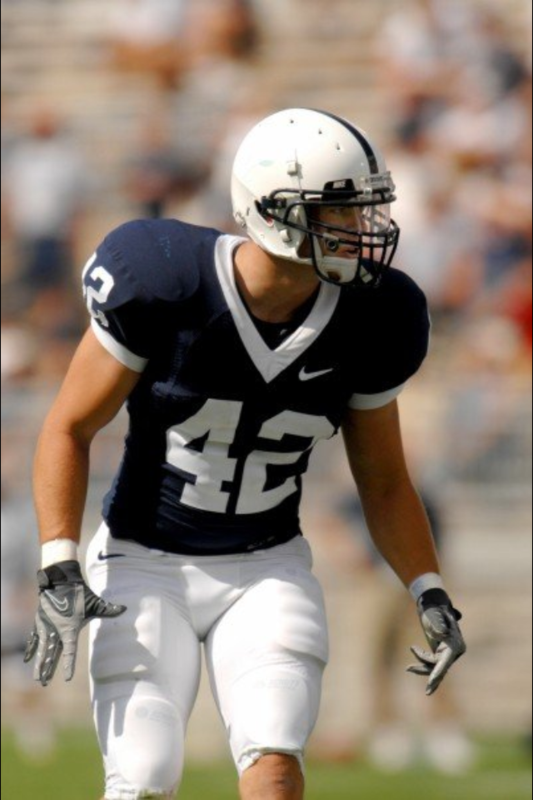 The four-time Academic All-Big Ten selection spent most of his Nittany Lions career as a holder and a special teamer. Notably, he held for Kevin Kelly’s game-winning kick in Penn State’s three-overtime, 26-23 win over Florida State in the 2006 Orange Bowl. Ganter was also active in Uplifting Athletes, which was started by the Penn State football team during his freshman season in 2003 — he actually helped coin the organization’s name and served as its vice president from 2005 to 2007. After he graduated in December 2007, Ganter worked for AT&T as a business account manager for about three years before deciding to enroll in Penn State’s Smeal MBA program in August 2010. Just as Ganter was completing his MBA orientation, the Jonas Brothers arrived in State College for the night to celebrate Joe Jonas’ 21st birthday. Jonas was turning 21 the midnight of the Jonas Brothers’ Aug. 14 show in Hershey, Pa., and the band’s managers, State College Area High School and Penn State alums all, decided to bring the middle Jonas brother to Happy Valley for the complete 21st-birthday experience. “You’re not having your first legal drink in Harrisburg. We’re going to the Phyrst,” Jonas was told, according to Ganter. Ganter had known the Jonas Brothers’ managers because they grew up with his older brothers in State College. So, shortly after he finished orientation for the day, Ganter received a call from the Jonas crew to head down to the Phyrst. There, he struck up a conversation with the Jonas Brothers’ manager Phil McIntyre, who had been looking for an executive assistant. The next day, McIntyre offered the job to Ganter. After some deliberation, Ganter took the job and deferred admission into Smeal, a decision that sent him on a two-year ride around the world, touring with the Jonas Brothers. He eventually became Joe Jonas’ executive assistant — a position that put him at Jonas’ right hand, literally. Ganter, Joe Jonas, and John Taylor, a Penn Stater — and musical director and backup guitarist for the Jonas Brothers. That ride ended in the fall of 2012, when Ganter returned to State College to complete his MBA. After his first year in Smeal, he completed a 2013 summer internship with NBC Sports Group — focusing on sports broadcasting production — and then he returned to Penn State in Aug. 2013 for his second year, looking for another experience with which to close out his academic career. Ganter was browsing the Smeal website for up-and-coming positions in projects around campus when he stumbled upon a graduate assistant opening with the Lunar Lion. He was originally brought onto the Lunar Lion team to assist with the project’s business operations. However, within a few weeks, the team realized that it was in dire need of “a more succinct and smoother communications process as it relates to fundraising, PR, and overall brand recognition,” according to Ganter. He was then reassigned to the Lunar Lion’s PR team as its Director of Communications, the position that he currently holds with the moon mission. This is not the end of Ganter’s story, however. Far from it. He is currently taking a seven-week break from his communications director duties to help cover the Winter Olympics in Sochi with NBC. Ganter was gracious enough to FaceTime with Onward State from Sochi, to chat more about his football career, his experience serving as Joe Jonas’ executive assistant, his time at the Olympics thus far, and his work with the Lunar Lion. Onward State: Why Penn State — for both undergrad and for your MBA? Jason Ganter: A lot had to do with the fact that it’s State College. The people, the community, the traditions – there aren’t many places like this in the world. I ultimately made my college decision based on the football program I was going to be joining. I wanted a program that could win, a program with unmatched tradition, and a program that was interested in preparing its players for life beyond their days on the field. It turned out to be very convenient for me that the program that met all of that criteria was right down the road. My decision to choose Smeal revolved heavily around the opportunity to leverage its alumni network as well as the stellar level of professionalism of its faculty and administration. They’ve really been incredible the whole way through. OS: What’s your favorite memory from your time as a Penn State football player? JG: One of my favorite memories as part of the Penn State football team was the entire 2005 season that culminated in our win over Florida State in the FedEx Orange Bowl. We won the Big 10 Championship and finished No. 3 in the country that year. The entire season was an incredible display of great teamwork and determination – most of all, the whole season was a lot of fun. I really learned a lot about what it takes to become a successful team during that season. Experiences like the 2005 season allowed us to form a lot of solid friendships that are still going strong today. Looking back on these relationships and friendships are ultimately what my favorite memories from my time on the football team are. OS: How did you come up with the name for Uplifting Athletes? JG: When I began working with what is now known as “Uplifting Athletes,” the organization was named “Lift4Life.” Lift4Life was our signature annual fundraising event that grew to be so popular and so successful that we had to separate the entirety of the organization and its mission from the signature fundraising event. During one of our team brainstorming sessions to come up with a name for the parent company of Lift4Life, one of the team members urged everyone to keep in mind how much of an uplifting experience this was for all of the student-athletes that were fortunate enough to be involved. From that suggestion, the name was born. OS: Walk us through an average day touring with the Jonas Brothers as Joe Jonas’ right-hand man. JG: Touring with the Jonas Brothers, and later with Joe on his solo tour, was as incredible of an experience as you could imagine. What I remember most was the levels of professionalism and dedication the boys carried throughout. They always allowed their fans to be a part of their success and understood that without their fans – they wouldn’t have made it to where they are. Touring with Joe as his Executive Assistant on his solo tour was an adventure. There was no such thing as an average day. Waking up in a different city or a different country every day made it difficult to keep a schedule. We just had to roll with it. OS: While working Joe Jonas’ executive assistant, did you have your own fans? JG: [Laughs] No. I didn’t have any fans, and rightfully so. The boys and the backup band were the stars – they’re the ones with the fans. OS: You’re currently in Sochi helping cover the Olympics. Are you experiencing culture shock there? JG: Fortunately I didn’t experience any culture shock. It’s a business trip and there’s a large NBC contingent over here and a lot of familiar faces, which always helps to lessen the shock. OS: Let’s change gears and talk about the Lunar Lion. Before joining the moon mission, were you a space nerd in any capacity? If not, do you think you’ll become more interested in space exploration as your work on the project continues? JG: Prior to my involvement with Lunar Lion, the only degree of space knowledge I possessed came from watching Hollywood movies like Apollo 13, Armageddon, and Mars Attacks. When I finally dove into my role with Lunar Lion and submerged myself with the subject matter, I became fascinated. Albeit, the majority of my new-found interest was sparked from a businessman’s perspective while reading about Richard Branson’s Virgin Galactic private space flights. The entire movement of the privatization of space exploration was as interesting as you can get. It’s essentially an untapped market with infinite room to grow — literally. OS: How will the Lunar Lion change Penn State — from an academic or research standpoint, and from a reputation standpoint? JG: Landing on the moon has only ever been done by the United States, Soviet Russia, and now, China. If Penn State becomes the fourth entity to land on the Moon, Lunar Lion’s success will change the space industry forever. It will allow us to reinvent the way space is explored. Academically, this will provide a whole new generation of students the opportunity to be able to focus on space exploration. And, from a research standpoint, the floodgates will open, solely based upon the fact that a university-led mission to the moon is now a legitimate possibility. OS: Last but not least, this question is a staple of all Onward State interviews — what is your favorite dinosaur, and why? JG: My favorite dinosaur is the Gigantosaurus — the Honey Badger of dinosaurs. It wasn’t afraid of anything and ate whatever it wanted. It was fearless and feared by all. It was known to have willingly attacked and feasted on some of the biggest dinosaurs ever recorded.